'Tis the season for soups and stews and this root vegetable stew is not only healthy, but tasty too. You can throw all kinds of odds and ends into this stew and the process would be the same. 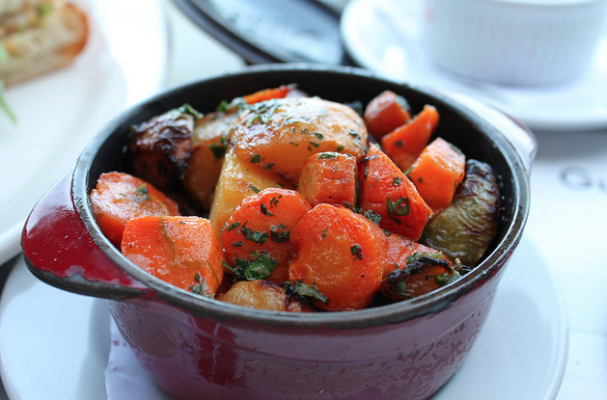 I like using all root vegetables because they cook at relatively the same pace. This specific combination uses butternut squash (not a root vegetable but still delicious), carrots, parsnips and potatoes. If you want to enrich the stew, you can add a drop or two or cream or garnish with some whole plain yogurt. Step 1: Heat olive oil in a heavy bottomed soup pot over medium high heat. Add the onion and garlic and saute the aromatics until fragrant and onions appear translucent, about 3 to 5 minutes. Add the butternut squash, parsnips, carrots and potatoes and season with the cumin, cayenne pepper, and cinnamon stick. Cook the vegetables until just softened. Add the vegetable broth and tomatoes and season with salt and pepper. Step 2: Cover the stew and reduce the heat to low. Simmer the stew for 20 to 30 minutes until all vegetables are fork tender. Remove the stew from the heat and garnish with the parsley. Taste the stew and add more salt and pepper, if necessary.